The Belly Fat Diet is found in Belly Fat Breakthrough written by Karlene Karst, RD, a leading health specialist in nutrition and natural medicine. The Belly Fat Diet calls our attention to the growing and dangerous problem of belly fat and provides valuable tips regarding diet, exercise and nutritional supplements, that in combination will help you overcome belly fat forever. Firstly the causes of belly fat are discussed to help you understand the factors that may be involved in your situation. These include genetics, sedentary lifestyle, lack of sleep, stress, hormonal issues, blood sugar imbalances, poor diet, deficiencies of healthy fats and environmental toxins. Detailed information is provided regarding the hormonal factors that play a role in obesity and the development of belly fat. In particular insulin resistance is highlighted and a questionnaire is provided to help you determine if you are at risk. To keep insulin resistance under control dieters are encouraged to consume “belly safe carbohydrates” like whole grains, vegetables and legumes. The Belly fat Diet educates Dieters about the importance of healthy fats and the role of the essential fatty acids for reducing excess belly fat. You are advised to consume high quality proteins and to include protein in every meal or snack. When you first get started you are given the option to substitute one or two meals a day with a protein shake. You should avoid starchy and sugary foods, trans fats and artificial sweeteners and limit the intake of salt and alcohol. Additionally, The Belly Fat Diet advises dieters to supplement with a whole food multivitamin and fish oils. High linoleic safflower oil is highlighted as a therapeutic food that has been found in scientific studies to enhance the loss of belly fat. Milk, cheese, yogurt, nuts, seafood, chicken, turkey, lean meat, eggs, lentils, whey protein, oatmeal, brown rice, green vegetables, apples, berries, avocado, flax seed oil, extra virgin olive oil, coconut oil, cayenne pepper, green tea, xylitol, stevia. Regular exercise is encouraged in The Belly Fat Diet because it has dramatic benefits for your health. If you are currently not engaged in a routine of physical activity you should build up in small activity “portions” of 10 to 15 minutes over time. Strength training and core building exercises can particularly help to reshape your body. Aerobic activities such as walking, cycling, dancing and swimming are also recommended to improve cardiovascular health. The Belly Fat Diet also includes instructions for a 30-minute circuit-training program that can be performed three times a week. 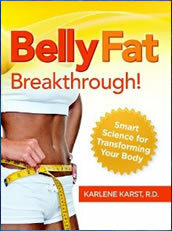 The Belly Fat Diet found in the book, Belly Fat Breakthrough: Smart Science for Transforming Your Body retails at $9.99. Encourages the consumption of fruit and vegetables, low glycemic carbohydrates, lean proteins and healthy fats. Provides information about the connection between hormones and weight management. Encourages exercise and includes a simple exercise plan. Encourages a healthy lifestyle approach to weight management. The Belly Fat Diet will appeal to dieters who prefer not to follow a structured diet plan. Encourages the intake of milk, which has been shown to increase insulin levels, and often contains artificial Insulin-like Growth Factor. The Fat Belly Diet does not include a meal plan or recipes. Most dieters will require more guidance and suggestions for meals. Does not provide precise information regarding serving sizes. May take some time for weight loss to become apparent. High linoleic acid safflower oil is not readily available. Belly Fat Breakthrough provides general information about the type of eating plan that can help to reduce obesity and excess belly fat. This Flat Belly Diet does not include a meal plan or meal suggestions, and the advice regarding calorie intake and portion sizes is non-specific. As such, inexperienced dieters will probably require more guidance than is provided here, in order to achieve successful results.